The Yellow-capped Weaver was formally described by Anton Reichenow, a German ornithologist and herpetologist. The Yellow-capped Weaver was collected by Georg August Zenker, a German zoologist and botanist. In 1886 Zenker accompanied Italian explorers on an expedition to the lower reaches of the Congo River. He then settled on a plantation in Gabon. The company had to give up the plantation in 1889, so the company owner made Zenker head of the research station at Yaounde in the interior of Cameroon - Zenker remained here from 1889-1895. Zenker collected 5000 plant specimens and a number of birds which were sent to the Berlin Museum. Zenker collected a female Yellow-capped Weaver sometime between 1889 and 1893, probably closer to 1893. Unfortunately the crate containing the Yellow-capped Weaver type became wet, and mould appeared on this specimen. Although damaged, the type is still in the Berlin Museum. The male Yellow-capped Weaver was first described several years later by Bates 1911b, who collected a pair at Bitye, Cameroon. 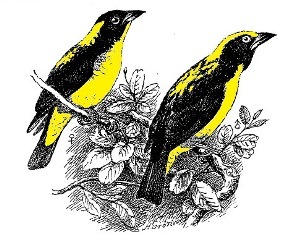 The first illustration of the Yellow-capped Weaver was of the type, published by Reichenow (1896) three years after he published the description. 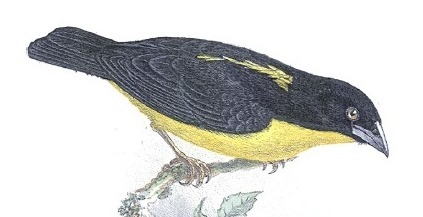 The next illustration was by Ogilvie-Grant 1917, who painted the head and chin patterns of male and female Yellow-capped Weavers, this being the first time that the male was illustrated. Symplectes dorsomaculatus	Reichenow 1893b,	Orn. Monatsber., 1, p.177,	Jaunde, Cameroon. dorsomaculatus, Latin: dorsum, dorsi, the back; maculatus, spotted, blotched (maculare, to stain). Mottle-backed Black-winged Weaver (Shelley 1905b). Mottle-backed Black-winged Weaver, The Yellow-capped Weaver, Yellow Capped Weaver. The type is in the Berlin Museum (ZMB_30841). Identification. The Yellow-capped Weaver is similar to the 'nuthatch' (bark-gleaning) weavers, though no longer considered to be one (see here). The Yellow-capped Weaver overlaps with the Brown-capped Weaver and Preuss's Weaver in range, but differs from them in having a black rump, and little yellow on the black back. The male has the forehead to nape yellow, and the female has a black head but yellow nape and throat. The juvenile is olive-green below, with a brown bill, and is blackish-brown above, and over time this is replaced by yellow and black. Distribution. 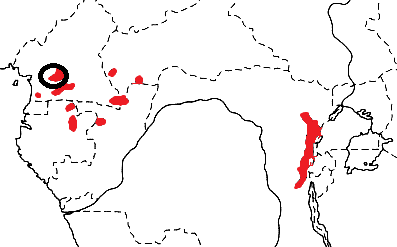 The Yellow-capped Weaver occurs in two widely separated populations: in eastern DRCongo (and 1 recent record in Uganda), and in West Africa from south Cameroon and Central African Republic to northern Gabon and Congo Republic (see map below, based on Birds of Africa). There are no subspecies of the Yellow-capped Weaver. 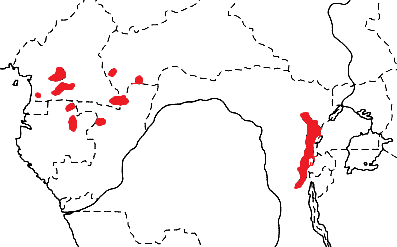 It is a very poorly known species with a patchy and very localized distribution. Habitat. The Yellow-capped Weaver inhabits evergreen forest. In primary forest it is often found near clearings, and it enters secondary forest. Food. The Yellow-capped Weaver feeds on insects and other arthropods, including butterflies and caterpillars, larvae of mantids, alate termites, and spiders. It forages in foliage in the canopy and middle storey, but not along branches as in the 'nuthatch' weavers. It flycatches insects in the open canopy. The Yellow-capped Weaver occurs in small flocks of 6-8 individuals, and also joins mixed-species flocks. Breeding. The Yellow-capped Weaver is a solitary nester and is probably monogamous. The nest is ball-shaped, with a short, loosely woven entrance tunnel directed downwards. The nest is woven around the fork of a hanging branch more than 30 m above the ground. The eggs have not not described and nothing else is known about breeding.